During our long absence from posting, here in the South we’ve had EPIC storms. Rhema handles storms fine; you’ve all seen the pictures of her wearing her helmet in the hall while sitting in her wagon. LOL! These storms were different; we lost power for extended periods of time. To my surprise these occasions of black-out did not really overly frighten Rhema. Now, she did not like it; she would ask a hundred questions and chat away about the same things over and over. So, to help her process the overwhelming frequency of the black-outs during the course of several week span, we started calling them “Flashlight Parties” to keep her in a good frame of mind. During one of the extended times, I took this picture of Rhema in her room. 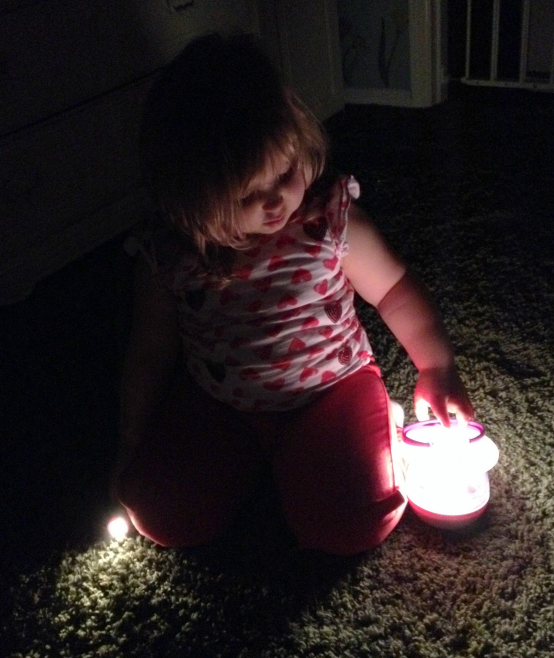 She has a small Princess flashlight in one hand and her pink lantern in the other. Yes, even in the darkest times, she is a stylin’ diva! LOL! We used this time to talk about how with Jesus we do not have to fear; that we are perfectly loved and “perfect love casts out all fear.” Who knows if she will ever remember the epic storms that ripped through our region during the early stages of her life, but if she does, I hope she remembers that we did not fear and about our awesome pink flashlight parties!